After all of the stress of wedding planning, you definitely deserve to properly recharge on your honeymoon. Although it’s safe to say that counting calories or following a strict diet while on vacation will not help with this, that doesn’t mean you can’t balance it out with some healthy honeymoon habits. Here are my top tips for staying healthy while you’re over the moon. Start your day off right on the day of your flight with a protein rich breakfast which will help keep your blood sugar levels stable and keep you energized for your flight. My go to options are a two egg veggie scramble, power protein shake, or my signature protein pancakes. Just because you’re not getting a gym workout in doesn’t mean you can’t get moving! Traveling to a new location is the perfect time to explore your surroundings by walking, shopping, or swimming in the ocean. There’s no reason to overly exert yourself, but staying active will help your digestion and will help you feel less bloated overall. Your honeymoon is your time to recharge, relax and fully enjoy the culture and specialties of a new country. Does this mean you should go for the dessert after every meal? Not exactly. My suggestion is to indulge mindfully by slowly eating and truly savoring the gelato, wine, or fancy dessert. It’s all about making the choice to indulge but not go overboard since it’s no fun to come home bloated and heavier than when you left. And remember, our body listens to what we do most of the time, not sometimes, so it’s perfectly okay to indulge! Planes are extremely dehydrating so make sure to drink a lot of water and herbal tea while flying to prevent water retention once you land. Once you arrive to your destination, drink plenty of water and don’t forget to have some water in between the pina coladas by the beach. For many of us, it’s hard to maintain healthy gut bacteria while traveling, so I recommend packing a high quality probiotic to help keep your digestion in check and bloating at bay. Vitamin C and zinc are great for keeping your immunity strong (especially if going to exotic destinations), while magnesium at bedtime can help you get a deeper sleep. Regular rest plays a huge part in maintaining a healthy lifestyle, so this is the time to give your nervous system a rest. 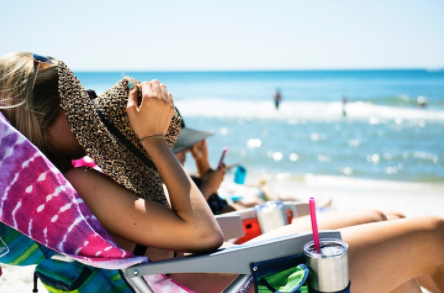 From lowering cortisol, to balancing your hormones and making you feel better when you get home, active rest should be your number one priority while you’re away!